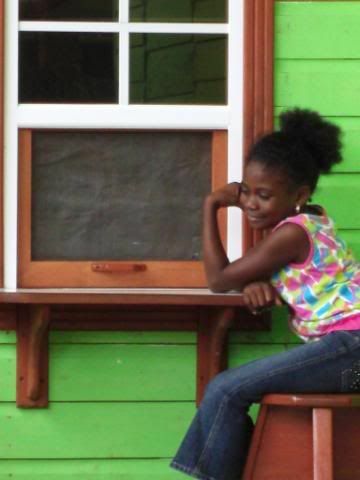 "They say your heart never leaves, once you've been down to Belize." 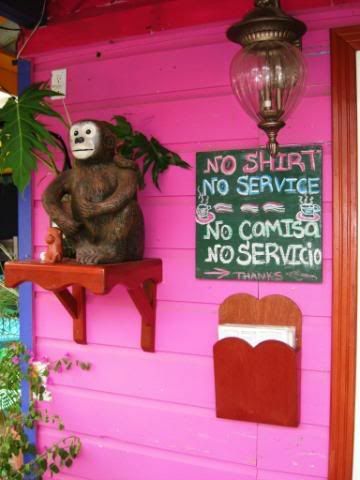 So says songwriter and part-time Belize resident Jerry Jeff Walker. Rob and I have been to Belize three times this year already and certainly these lyrics ring true for our family. I find myself reading and re-reading my online journal entries, pouring through page after page of pictures taken during our recent sixteen day adventure through this lush, green country. When plans to travel back to the U.S. for a popular food and wine festival fell through, I immediately suggested we venture south once more and visit some of the areas not reached on our last trip. 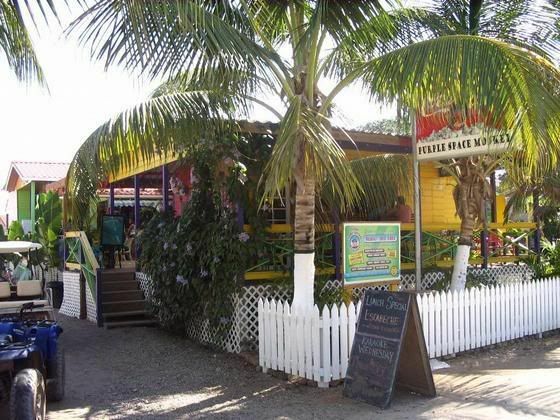 Placencia a tiny creole fishing village set on the end of a peninsula in the Stann Creek region held a certain fascination for us and had been recommended as a fun destination by several like-minded friends. Despite the devastation and flooding brought earlier in June by tropical storm Arthur, we discovered that the residents of the village planned to push forward with their plans to celebrate the opening of lobster season with the much anticipated, annual three day party known as Lobsterfest. This event seemed like the perfect way to spend a long weekend and so, we tossed a few bags in the car and made the five and a half hour drive to Belize City's Goldson International Airport. 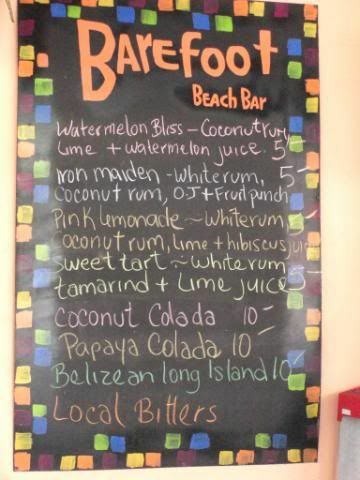 You know you're not in Kansas anymore at Jet's Bar in the Phillip Goldson International Airport. 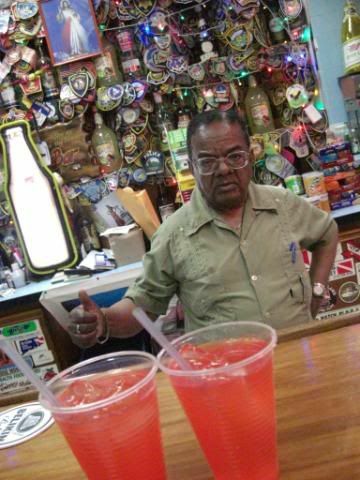 At just 4' 5" tall and 73 years of age, Jet has been serving up his world famous rum punch and hot dogs to thirsty travelers for the last 17 years. A true character and a force of nature, in 17 years he has missed just one day of work......the day he suffered a heart attack. I have a feeling Jet will there to greet visitors to Belize with his special brand of hospitality for many years to come. 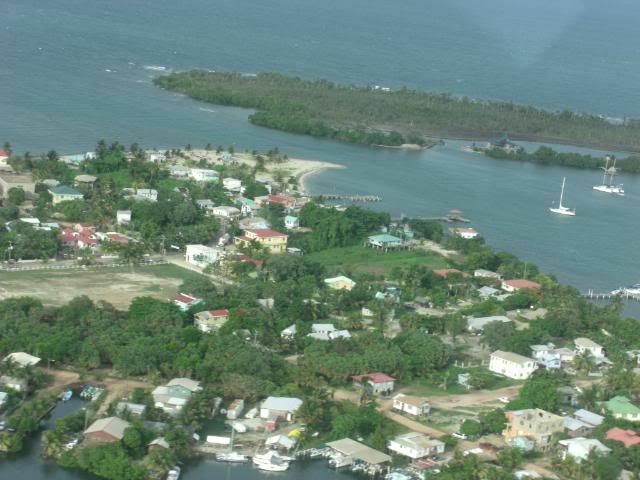 View of Placencia Village from the now familiar Tropic Air prop plane. The pilot buzzed the end of the peninsula to give us all a good show before putting us safely down on the small airstrip north of town. All said and done, the trip from Playa del Carmen to Placencia took us seven hours. We arrived starving and after checking into our beautiful bungalow at Turtle Inn (full review in process), we grabbed a cab into town to begin our weekend of conspicuous lobster consumption. Wendy's Restaurant, a local favorite owned and operated by Guatemalan born Wendy Lemus, came highly recommended but failed to impress. The restaurant was clean and pretty and the service was excellent but my meal, the grilled lobster was uninspired, tasteless and overcooked. We strongly suspected that dinner was not this restaurant's strong suit and made a note to return again for breakfast or lunch. Being one of the few (if any) dining establishments with air conditioning, we knew that Wendy's would make a fine mid-day oasis from the Belizean heat and humidity. Back on the quiet streets of the village, we followed our ears to a boisterous hotspot across from the sports field. 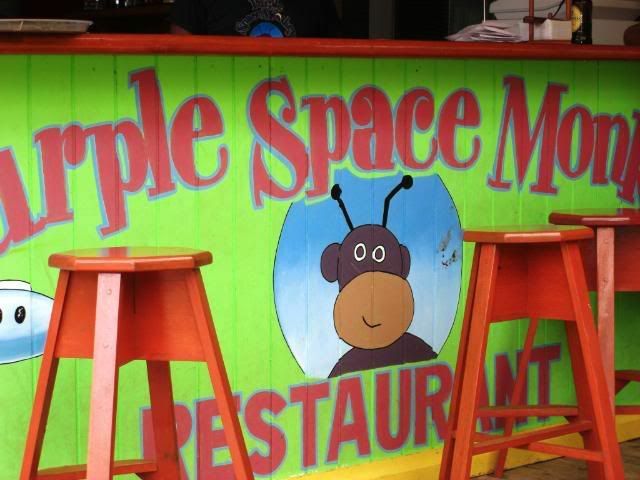 The Purple Space Monkey, clearly a favorite of locals and tourists alike, was packed to the rafters and hosting an evening of karaoke. 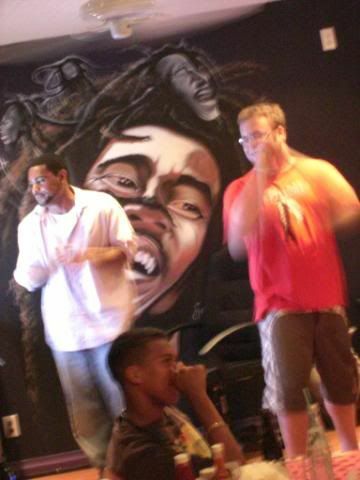 As I generally cannot stomach karaoke (especially BAD karaoke) we amused ourselves making fun of the drunken tourists and playing "I Spy the Ex-Pat". 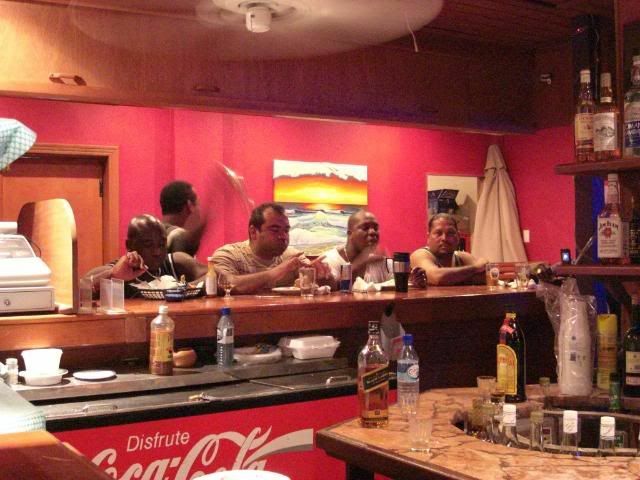 Enjoying the ubiquitous Belizean dinner of stew chicken with rice and beans, these local gentlemen turned a deaf ear to the shenanigans on the other side of the bar. What she lacks in size she sure makes up for in spirit! 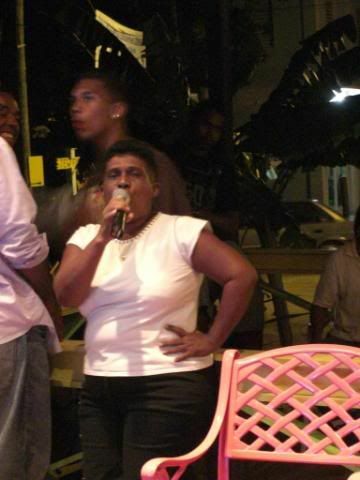 This local woman brought the house down with her rendition of "Harper Valley PTA"! Exhausted from a long day of travel and a few too many One Barrel and Sprites, we poured ourselves back to our resort and into bed and were quickly lulled to sleep by sounds of the incoming storm and the rain on the thatched roof overhead. We slept in late the next day and after being denied breakfast at the resort's restaurant, we headed into town and returned to the scene of the karaoke crime. The Purple Space Monkey is an obvious goldmine. 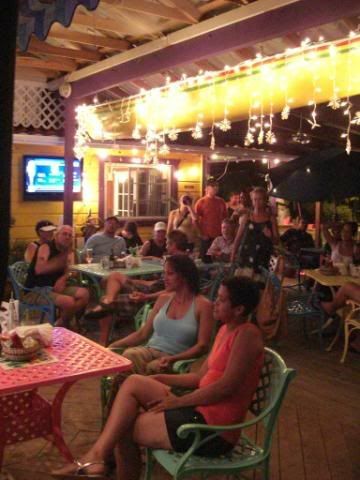 The bar is packed at night and the restaurant, serving delicious breakfast and lunch all day, is a pleasant place to sit and watch the world go by on "Main Street". There is a small lounge with a book exchange and three laptops set up with free internet access. Wireless internet is available as well for those of us who can't leave our technology at home! Several large screen TVs kept us entertained broadcasting the NBA Draft while great hits from the eighties played on Belize's favorite radio station, LoveFM. 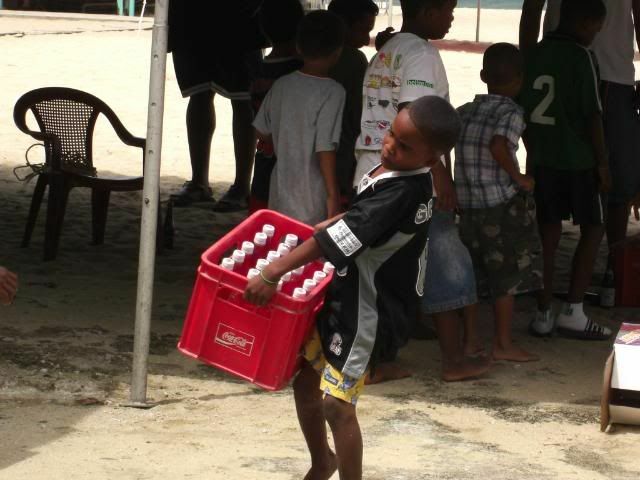 Business has been good for the owners of PSM and they in turn have been good to the community sponsoring Placencia's new Youth Center. Painted the same bright "Space Monkey Purple", the Youth Center is located across from the sports field just a few doors north of the bar. Due to open in July, the center will house a library, computer lab and a recreation room. Free summer and after-school programs will be available to all children ages 6 to 16. Activities and hours for adults and seniors will also be provided. 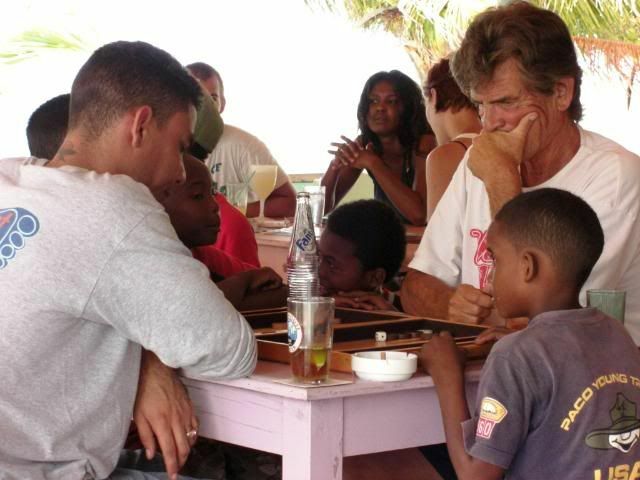 Stemming from the African saying "It takes a village to raise a child" the mission of this youth center encourages the cooperation of all residents of Placencia, each in their own way, to empower every child in the village to achieve their potential and fulfill their dreams. Truly, there is no more worthy an endeavor. Helping set up for the festival. 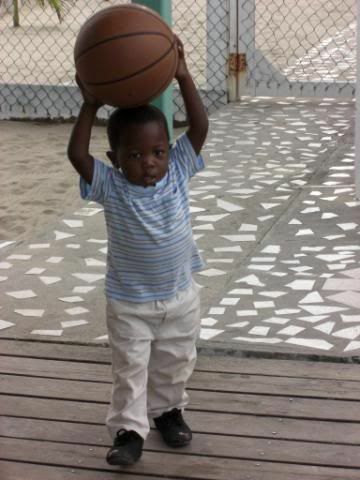 NBA #1 Draft pick, 2023 ! After acquiring a golf cart, we toured around for a bit and quickly found THE place to spend a lazy afternoon. 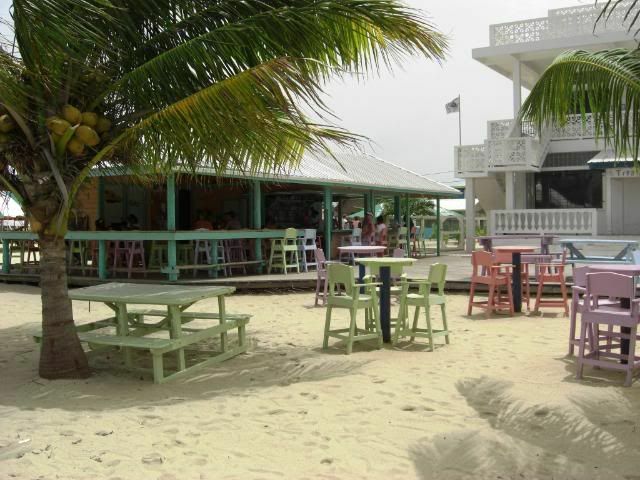 The Barefoot Beach Bar at Tipsy Tuna's was just the spot for us to relax over a few cold Belikins and chat up some fellow travelers. We had already identified some of the local ex-pats and many of them were in attendance chatting about their plans for the festival and playing backgammon. A row of wooden loungers that lined the beach sat empty as the ocean churned up piles of smelly seaweed torn loose by the recent storms. The sun did manage to peak through the clouds occasionally but this was certainly no "beach day". After a few (too many) Belikins and some really remarkable bar food, we wandered over to the festival grounds to watch the preparations and scout out which booths we would visit the next day. 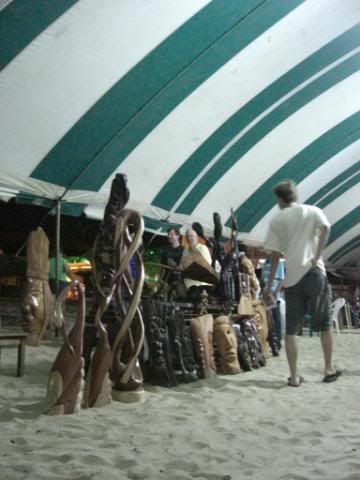 A few vendors were already selling food and several Belizean wood carvers were displaying their wares, carefully carted in from the mainland. 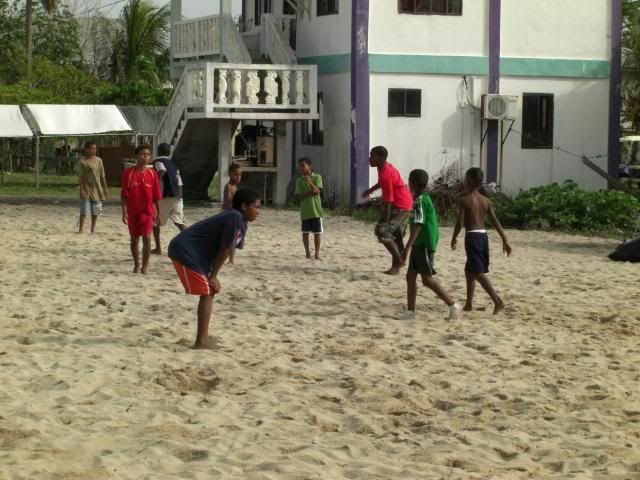 The Placencia Children's Olympics, featuring a fierce soccer competition, played out on the beach. Rob and I agreed that our next visit to this village would absolutely include our kids. Grilled skewers of lobster and sausage. 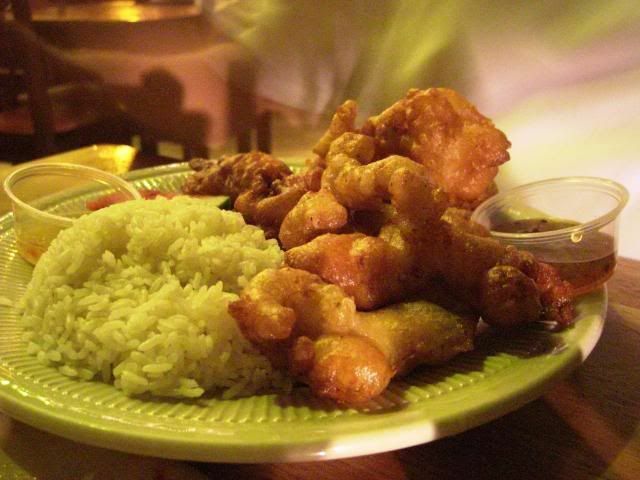 Pangs of hunger lead us to another local eatery, known for its seaside location and fresh seafood dinner. D' tatch Restaurant, named appropriately for its enormous thatched roof, lived up to its reputation with prompt, friendly service and tasty, well-prepared dishes. Mounds of fresh beer battered conch. Sadly, the countless beers consumed earlier in the day had taken their toll on us both and we were only able to manage half of our delicious dinners. Swollen and sleepy, we carted ourselves back to the resort and tucked in for the night. 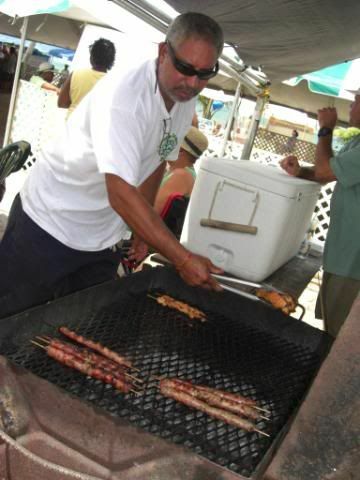 Next up....Placencia Lobsterfest 2008!! I leave you with the words of Jerry Jeff Walker until my next entry. They say your heart never leaves, once you've been down to Belize. Oh god! Do I love One Barrel? It's my favorite rum in the world and I've always been bummed that I couldn't buy it here in Mexico. I just love the way it tastes, like graham crackers in my mouth. Me too and thankfully, it doesn't seem to leave me with too much of a hangover the next day. I'm a big Fleur de Cana fan as well!! 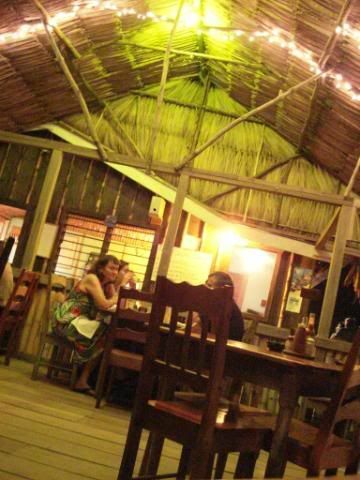 Great trip report makes me want to go to Placencia now.